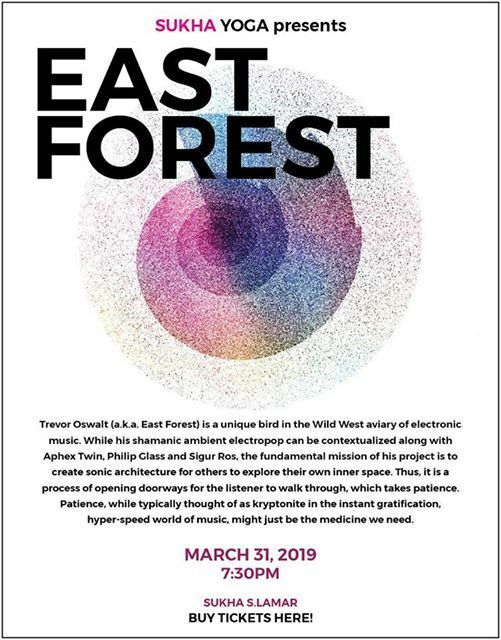 EAST FOREST CEREMONY bridges concert and ritual for a transformative life experience. Concert meets ritual in this multi-level experience which incorporates elements of MUSIC, MEDITATION and SOUND HEALING. As you enter the space the mood will be set with the smudging of palo santo or white sage. Choose a spot to unroll your mat and place your bolster or pillow. Begin to think about your intentions; write them out on a prayer flag to hang or place on an altar. 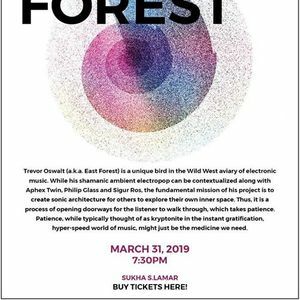 Rest and relax while enjoying a musical concert, mixing traditional East Forest songs with deep ambient soundscapes, that will move you through the energy cycles. Allow the music to take you on a inner journey, to lead you to the wellspring of wisdom within. End the evening with a deep savasana, followed by a social time that will allow you to share your experience and connect with others. Leave with feelings of tranquility, hopefulness and self-empowerment.